We are proud to say that we met the deadline and with great project management and equally dedicated sub-contractors the project started on January 1, 2008 and was completed by January 10th 2008 . The restaurant re-opened January 11th with rave reviews on it’s “New Look”!!! Click here to view the Holiday Showcase Commercial Interior Design project page. Whether it's a residential, commercial or healthcare project, our focus is on your needs. YOUR home should be a reflection of who you are and how you live. Our inspiration comes from listening to and collaborating with clients to develop interior design solutions that reflect their taste and lifestyles. 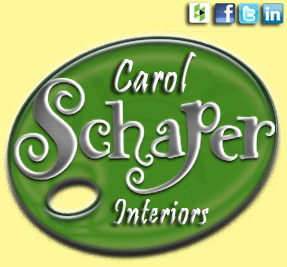 Carol Schaper Interiors focuses on the Interior Design of new construction and renovations of residential interiors as well as commercial and healthcare interiors. We orchestrate the entire team of vendors, contractors and service providers, from the conceptual stage to the completion. We handle all of the details that can be so overwhelming in the design process, saving you time and money. Copyright 2015 - Carol Schaper Interiors, Inc.